Where can I take the test? When can I take the test? We answer your questions. IELTS Test Locations are listed below. Click on the link for your chosen location and follow the instructions to register and pay online, or click here for details on other ways to register for the test. The test is currently held up to 4 times a month at IALF centres. It is also held regularly at test sites throughout Jabodetabek and at provincial sites across Indonesia, as well as Dili in Timor-Leste. Offsite tests can be arranged for special groups of 12 candidates or more: please contact us if you would like us to conduct the IELTS test at your office or college. If you want to register for one of these dates, you can either click on the Register and Pay Online button or click here for information on other ways to register and pay. Registration begins at 7.30am, 1.5 hours before the test starts. Click for more details about On the Day or download Information for IELTS Candidates at IALF Surabaya. 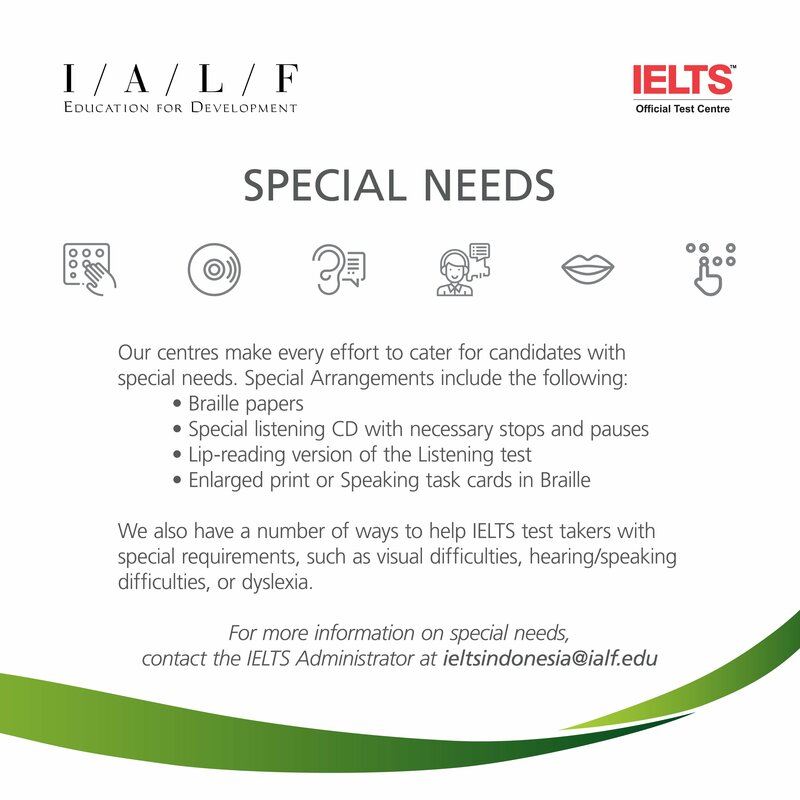 Click for more details about On the Day or download Information for IELTS Candidates at IALF Bali. Click for more details about On the Day. 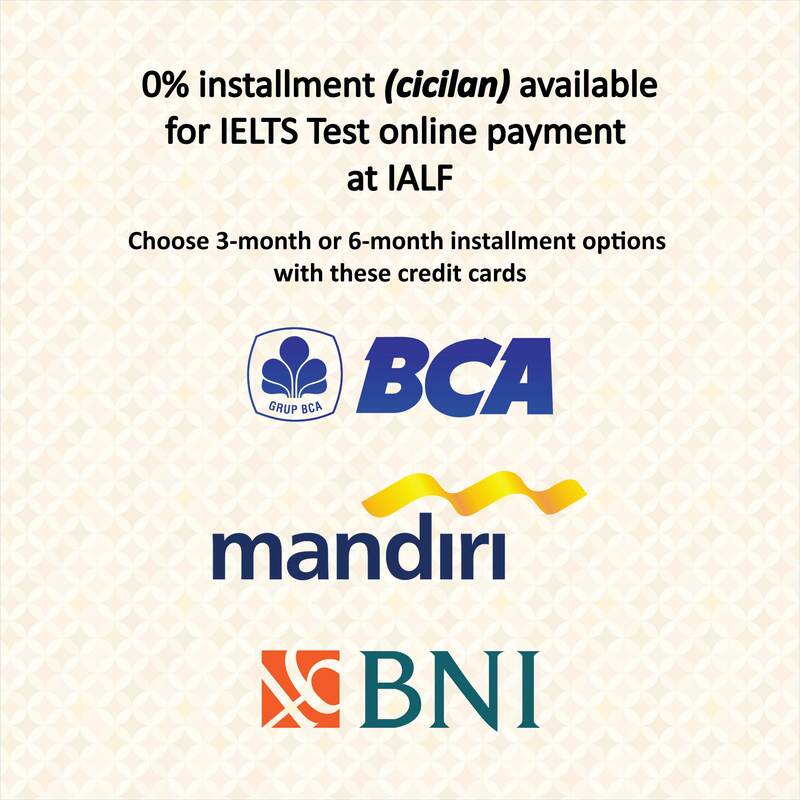 There are two test locations in Batam, managed by different IALF branches. Google Map link to the IELTS test location. Google Map link to the IELTS test location in Lampung. Google Map link to Rajawali Centre Points, Palembang IELTS test location. Google Map link to the IELTS test location in Semarang. Google Map link to Real English Yogyakarta IELTS test location. IALF works with a number of partner institutions at several locations in Indonesia and provides the IELTS test on-demand at these venues on certain dates. Please contact the agents below for test dates at these locations.